My first MP3 player, an original Creative Labs Nomad (one of the first MP3 players), was simple to operate. I took MP3s I’d ripped and dropped them on the device like a drive. So, what’s happened since then? Now music players have grown much more complex, deeply tied to Digital Rights Management. Some new Windows Media devices (like the iRiver clix) appear to be tied entirely to the Windows OS and Windows Media Player, or to operate only with DRM controls. Meanwhile, the PC press, instead of taking a critical eye to the situation, have been running to embrace another DRM-laden music service (MTV Urge) as the greatest thing since . . . well, iTunes (a player that also locks out truly free, independent music distribution). Is there a way to escape reliance on single software vendors, be it Apple or Microsoft, and get back to the simplicity and enjoyment of dragging and dropping your music on your player? The answer is overwhelmingly yes, but (as usual) there’s a lot of misinformation out there to clear up. And I’ll admit it — I was one of the ones who was misinformed. Now, as it happens, since the U10 hardware is the same in Asia and the US, a firmware update can switch it from MTP mode to UMS mode. I just got a U10 and applied the update, and sure enough, I can now connect it to my Macs and Linux without any fuss. (There are other issues with iRiver’s made-up proprietary playlist format, but as long as you don’t mind using the Browse option, you can benefit from dragging and dropping music and organizing it however you like.) See the screen grab above of my performing the operation. 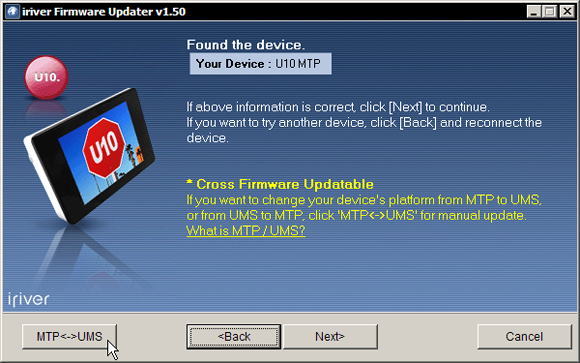 iRiver explains the technology and links to firmware updates for the U10 and other players on their MTP page. Mac users are still out of luck unless they have access to a Windows PC, though, because you need to run Windows to update the firmware. Once you do, though, you have a player that connects to any computer without trouble. MTP is proprietary to Windows: Not exactly. Microsoft did develop MTP, so it is technically a proprietary format; it’s actually extended from the protocol used to connect digital cameras. But unlike Microsoft’s DRM technology, for which Microsoft charges a license fee, MTP is freely-licensed. Check the Wikipedia story on MTP for a good explanation of what the heck MTP is and some links to software that makes it work (with some players, anyway) on Linux and Mac. MTP is DRM: Totally wrong. MTP just happens to be a protocol that supports DRMed music. You can use it to transfer non-DRMed music if you really want to, and it actually does support drag-and-drop in Windows; if you drop an OGG file on an iRiver U10 or clix through Windows Explorer, that’s exactly what you’re doing. So DRM and MTP are two different things, even if they’re both part of Microsoft’s PlaysForSure specification. MTP requires Windows Media Player: I actually thought this, at least that it required Windows with a shell extension installed by the WMP installer, and I’m wrong — or, at least not entirely correct. See above. MTP can even be made to work with Linux or Mac. The only problem with this: not all players appear to be supported, so this to me isn’t such a great solution, especially when UMS does the same job without any extra software. I think we can safely rewrite this statement as MTP isn’t as widely compatible as UMS — to put it mildly, at least if you don’t spend all your time on Planet Windows. iRiver released a firmware update because they saw the error of their ways and want to start a revolution: No, sorry, totally wrong. This is effectively what Boing Boing claimed in their article. In Cory Doctorow’s version of events, hackers made the iRiver players work with UMS instead of MTP to get around broken DRM technology, iRiver “took the hint,” and came to our rescue by throwing away its PlaysForSure specification and releasing an update to liberate its players so they work with UMS again. An interesting story — except it’s not true. There are two versions of the firmware (UMS and MTP) so that iRiver can sell to different markets, including Asian markets where people could care less about MTP because they have no reason to use it — i.e. they don’t have a Windows Media subscription store online. Yes, iRiver did give users a choice to switch back to UMS on the U10. But Boing Boing’s timing was off: they ran their story May 26, just as iRiver was pushing its updated version of the U10, the clix, which has zero UMS support, is entirely dependent on MTP for all transfers, DRMed subscription and otherwise, and even includes Windows Media Player 11 with a special version of MTV’s Urge service. Does that sound like a company gone rogue, sticking it to the Man by rejecting Microsoft’s DRM? Uh, no. UMS is not an intuitive or user friendly means to get content on to a device for many people, and doesn’t support DRM. Sure – lots of folks don’t like DRM, but without it the record labels won’t let any of us purchase music online, so we need to live with it. MTP enables the Clix device to look like a media player in Windows, enables pictures and music to be seamlessly sync’d in WMP11 and enables DRM’d content to be transferred. Also, MTP is being standardized as a public standard in the USB-IF, so while almost all music players support it today, more will in the future. In response to Peter – lets differentiate between the protocol and implementations. MTP is capable of all that UMS is, and then plenty more. Allowing a device to enumerate it’s capabilities (vs. UMS where the OS has to examine the contents of a device), allowing control of the device, support for all kinds of DRM, support for firmware updates, MTP is file system agnostic, etc… are just some examples. I think, though, you raise some good points as to the _implementation_ of MTP. Drag and drop is a very intuitive way to get content on to a device, and MTP fully supports this. So does WinXP+WMP10/11 with what we call the “shell extension” – double click on an MTP device and you can drop files on it just like UMS. You don’t need to be in WMP to transfer content – only DRM’d content, which you can’t transfer with UMS in a drop/drop manner anyhow. Additionally, Microsoft doesn’t *require* that vendors entirely disable UMS support on devices in order to achieve the PlaysForSure certification – just that UMS, if supported, must either be automatically switched on the device (so less experienced users don’t have to face a choice of which protocol to use) or found in a “safe mode” for device recovery purposes. Any device implementation which goes further than this and, for example, doesn’t support UMS at all – is a design decision of that particular vendor. That’s fair — but we should also keep in mind, what users see is implementations, and by and large UMS is implemented in a more complete, platform-agnostic form than anything else. David goes on to say that the problem isn’t drag-and-drop being counterintuitive, it’s that UMS devices get drive letters “G:” instead of logical names “iRiver U10.” I think that’s amusing: the problem there is Windows. On my Mac, since the U10 is a USB device, the volume shows up with the name of the device. I’d say you don’t have to be a “power user” as David argues to figure out that dropping music files onto an icon with the name of your music device moves music to it. So I don’t understand why Microsoft claims you have to use MTP to get the name of the music device instead of a drive letter when it’s obviously not so. Meanwhile, if you can deal with Windows, you can probably also deal with music players having letters. As for why the clix supports MTP and not UMS and the U10 requires firmware updates to switch between the two, this actually demonstrates that it’s iRiver that’s to blame, not Microsoft. Let’s return to the underlying problem: whether MTP is “better” than UMS or not, UMS works on my Macs and Linux machines. MTP doesn’t, without some significant work (and possibly not, even then). And I’m confused by some of the selling points of MTP, because I frankly don’t notice most of these differences even on Windows and most (if not all, depending on implementation) could be accomplished with UMS. The only exception is DRM. And I’ll admit, I’m perhaps “unfairly” tilted against DRM because I found Yahoo, Napster, Rhapsody, and others more trouble than they’re worth. After months of buggy updates, lost licenses, broken music files, and kludgy, bloated software, I finally gave up on the whole thing. (And while I didn’t try Urge, I did all of this recently.) Not to mention, I have more choices with non-DRMed music (like CDs) than I do with the online stores. So we’re back to where we started: Microsoft and Apple playing politics with our music. (And I can really say “our” music since this is a site for musicians. We’re the ones creating the actual value; not meaning any disrespect to the people creating DRM technology, but you need us more than we need you.) Microsoft’s “open” DRM standard requires a license fee, and very few companies want to pay a license fee for this technology because Apple’s dominance means there’s no market. Is that Apple’s fault? Possibly, but it doesn’t change the problem: no license fee, no DRM, and you wind up buying music that you can play only on Windows and certain other devices (David cites Motorola on a non-Windows OS, but, um, I still can’t play my music where I want — and since I don’t work for Microsoft, there’s no reason for me to wait while business players take sides). Apple, meanwhile, is too eager to lock your entire music listening habits into their products to bother to support things like MTP, and they won’t license their DRM for love or money. Frankly, this stuff all makes my head spin, and it’s just too complicated. Who are you supposed to root for here? Microsoft, for trying to make you dependent on them instead of Apple? Record labels, for requiring this DRM in the first place and then letting Apple and Microsoft dictate terms to their customers, turning online music into a giant leap backwards from the early-80s tech of CDs? iRiver, for creating complex solutions when all they really have to do is turn on both MTP and UMS and let their customers do what they want? Now that’s my idea of progress. And I don’t have to use any special software or memorize weird Microsoft and Apple acronyms. I just drag and drop files, the way I’ve been doing on Macs and Windows since the 1980s. But I guess that makes me a power user. So be it.